Dimensions: 0.57" x 0.57" x 0.57"
Dimensions: 7" x 1.75" x 1.99"
Dimensions: 2.5" x 2" x 1"
Dimensions: 2.5" x 2" x 2"
Dimensions: 3.5" x 1.25" x 1.25"
Dimensions: 2" x 13.99" x 11.5"
Dimensions: 8.63" x 1.87" x 1.87"
Dimensions: 6.49" x 1.87" x 1.87"
High end fashion items such as fur coats and suite jackets need a security system that wont poke holes or potentially leave ink stains if a shoplifter tries to remove the security device. That’s where Cable Coat locks, saddle brackets and belt lock security devices come in handy. Each of these Mechanical Security Devices use cables to link around inside the garment or handbag. Weather you have a large or small clothing rack the Standard and Extended Cable Coat Locks will hold up to 8 garments. All you need to do is place the Cable Coat Lock on a clothing rack or wall and string the 6’ or 8’ long cable through the garments of your choosing and lock the cable inside the Cable Coat Lock. Click “Here” for more detail and don’t forget to speak with a Product Expert to order or for more information. In order to secure your garments with the Cable Coat lock properly you will need to purchase the cable to string through the garments to lock into the lock box. The Standard, Medium and Heavy Duty 6’ and 8’ cables come in 3 different internal diameter sizes; 1/16”, 3/32”, and 1/8”. The heavy-duty cable can hold more heavier items such as fur coats or big and tall suit jackets. When you want to add extra support for your Cable Coat Lock you can purchase the Saddle Bracket 1” or 2”. Placing this around your apparel rack bar and securing the T-Bar or U-Bolt to the Saddle Bracket you will prevent the Cable Coat Lock from falling off the rack bar. Another option for extra support for your Cable Coat Lock is the Shelf Bracket. 3 ½” x 1 ¼” x 1 ¼” in size making it a little bit bigger than the Saddle Bracket. Belts can be easy to swipe, however, with the Belt Lock Security Device you can prevent shoplifters from swiping your profits. 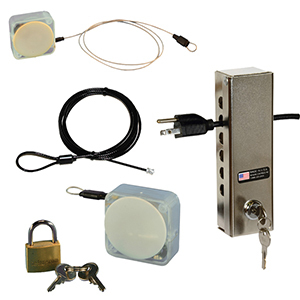 The Belt Lock Security Device is 2” x 1.99” x 11 ½” in size and can hold up to 6 belts.